The section Affiliates > Referrals provides detailed information about conversions related to transactions, the affiliates and commission amounts involved and the status of the referrals. 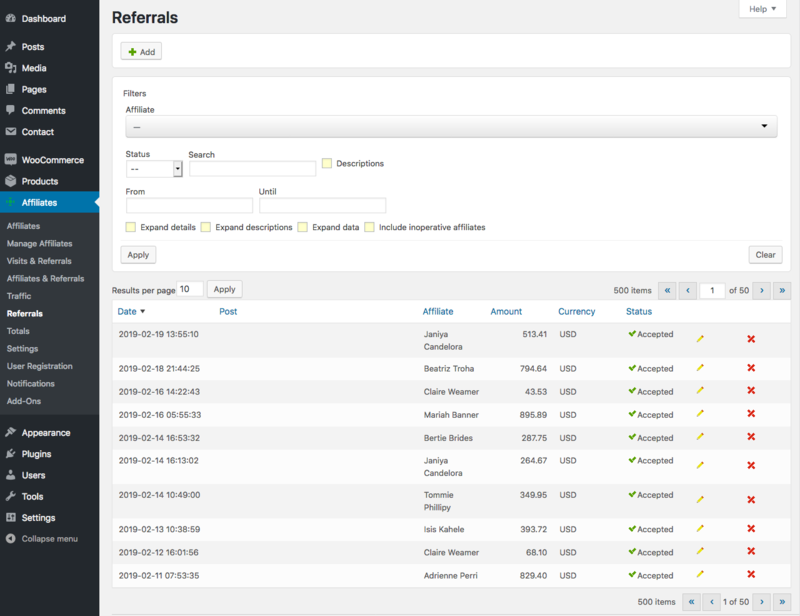 In this section you can also add referrals manually, edit existing referrals and remove them. This report also provides a Filters panel that allows to restrict the referrals displayed based on precise criteria. Here you can also request to expand more details on the referrals shown. Extended features related to handling referrals, more fine-grained referral items and an export feature are available in Affiliates Pro and Affiliates Enterprise. To use the filters, set the appropriate options and click Apply. The filter settings are persistent across sessions, so next time you access the referral management section, you will see the same filter settings and results. If you would like to reset your settings to show all results, click Clear. If several affiliate managers are using the system, it is noteworthy that the filter settings are applied on a per-user basis, i.e. each affiliate manager will be using his own independent settings. Affiliate : Use this filter to display referrals for a particular affiliate. Status : Use this filter to display only referrals with the chosen status. Search : Use this field to search among the recorded referrals, with an extra option to also search in referral descriptions. From / Until : Restricts the results to the referrals which have been recorded within the given dates. One or both options can be used. Expand details : Select this option to display referral data and description sections under each referral record. This option should be enabled if you choose to expand descriptions and data. Expand descriptions : Select this option to display a short description of the referral. Expand data : Select this option to display the data involved in a referral. Include inoperative affiliates : Includes referrals related to affiliates who are not valid anymore. It often is useful to be able to record non-automated or offline transactions that are known to have been referred by affiliates. An affiliate manager can use this to credit affiliates for any transaction. To add a referral manually, click the Add button, fill in the fields on the form and Save to create a new referral. In addition to the general referral fields, referral items are available in Affiliates Pro and Affiliates Enterprise – these can be used to reflect commissions on individual order items. To edit an already recorded referral, press the edit button for the desired entry, modify the fields as appropriate. Click the Save button when finished to record the modifications or Cancel to return to the previous screen. To delete an already recorded referral, press the delete button for the desired entry. Please note that there is no undo function after deleting a referral, so it cannot be restored unless it is re-added manually. The concept of closing a referral in the system implies that the corresponding commission has been paid to the affiliate and that the referral thus shall not further change status. Referrals can be closed individually or in bulk through the Totals section. To close an individual referral (implying that the related commission has been paid to the affiliate), go to locate the referral in the list and click the symbol to edit the referral. Under Status, select Closed and save the change clicking the Save button. Closing a referral also implies that the affiliate will see this reflected in her earnings overview, where accepted referrals are included as unpaid earnings while closed referrals are computed as paid earnings.